Searching for a quick, easy and oil-less snacks, here comes Bhel puri - I am giving you a healthy, home-made version of Bhel puri – easy-to-make if you have the main ingredients at home. The main ingredients are Puffed rice (murmura) and sev (omappodi) with a sprinkle of other items (always available at home) to make it spicy and tangy. Mix all the above ingredients and serve immediately. · To make more attractive and tasty - U can add diced boiled potatoes, fried peanuts, and mango pieces (if it is mango season) too. 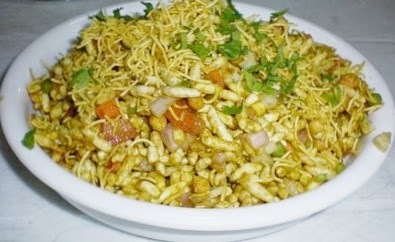 · To make authentic Bhel puri add tamarind chutney and spicy green chutney instead of Tomato ketchup.